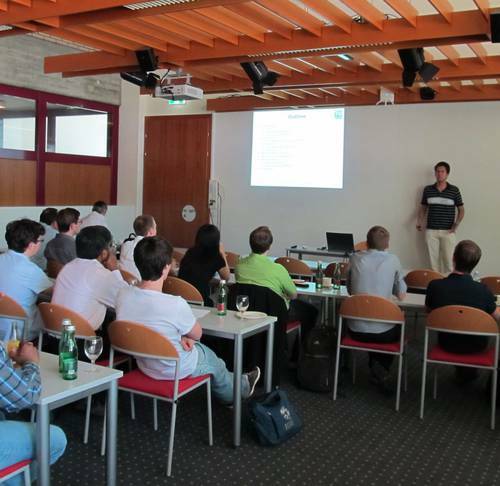 The third IEEE Forum on Signal Processing for Radio Frequency Systems on 18 June at Johannes Kepler University covered a broad spectrum of content from digital signal processing in HF senders and receivers to mathematical modeling of analog electronics, to various aspects of filter design. Simon Schröter (Institute for Technical Electronics of the Friedrich-Alexander University Erlangen-Nürnberg) held the keynote speech, entitled “A Systematic Approach for Designing Beam Steering Algorithms for the Uplink of UMTS by Evolutionary Optimization Techniques”. The award for the best student presentation went to Andreas Pderoß of the Technical University of Graz for his excellent talk on “Modeling and Identification of Nonideal Ultra-Wideband Multiplication Devices”. Serving discussion of early research results and current trends as well as promoting the seeking and enhancement of research cooperation, the forum was organized jointly by Univ.Prof. Dr. Andreas Springer, Institute for Telecommunications and High-Frequency Systems at JKU, LCMS’s K2 area Wireless Systems, and Dr. Christian Vogel (Telecommunications Research Center Vienna (FTW)). Financial support was provided by Austrian IEEE Joint COM/MTT Chapter, LCM, FTW and x.test GmbH. Over 30 participants attended 11 excellent presentations.